Does your Microsoft Access frequently showing cannot save the digital signature at this time error on your screen? What’s the issue is and how to fix this up? To answer such question the following blog will help you out. 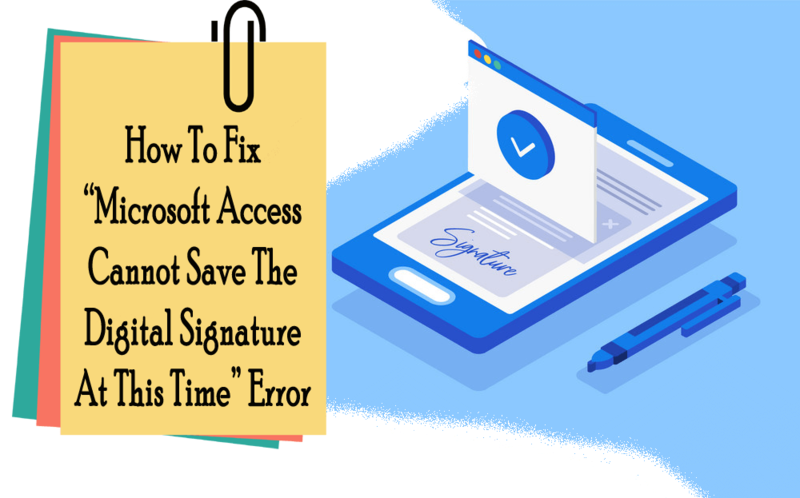 So, just go through this post completely and know each and every detail about this MS Access digital signature and its related issue. I´d like to know if I can sign the macros, objects and elements in Microsoft Access to disable the warning and confirmation windows when packaging an app built with Access. I know macros from Word and Excel can be sign but I´m having problems with Access. Digital signature can be defined as an electronic, encrypted, stamp of authentication on digital information like e-mail messages, macros or any electronic document. 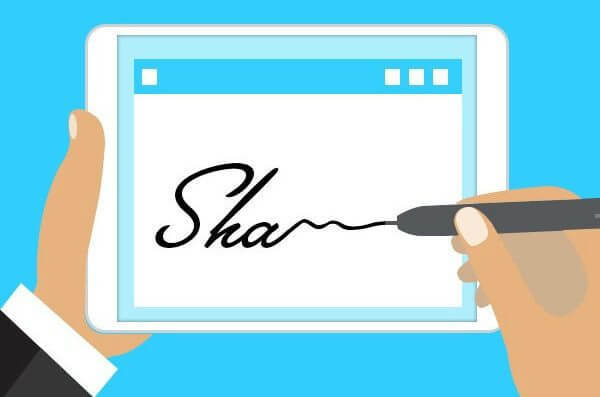 This digital signature signifies that the information originated from the signer and has not been changed. 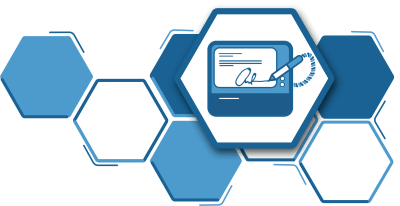 In order to create a digital signature you need to have a signing certificate which proves your identity. At the time of sending the digitally signed macros or document, you also send the certificate and public key. Signing certificates are issued by authority of certification and just like the driving license it can also be revoked. Certificate is usually valid for year, after which signer must renew or get some new signing certificates to build up identity. Whereas the, Certificate authority is an entity which is quiet similar to notary public. It has the authority to issue digital certificate and signing certificate to verify their validity. This entity also tracks for the certificates that are removed or get expired. Following are the things that Digital Signature Guarantees. Integrity: content can’t be changed or tampered as it was digitally signed. Repudiation indicates the act of a signer denying any association with the signed content. So Non-repudiation , proves to entire parties the origin of the signature content. Authenticity: singer is full authenticated as a signer. Signature done in Word, Excel, or PowerPoint files which are timely stamped by a secure time-stamp server under certain circumstances, have some validity time period for Notarization. What Are The Necessary Criteria For Microsoft Office Access Digital Signature? 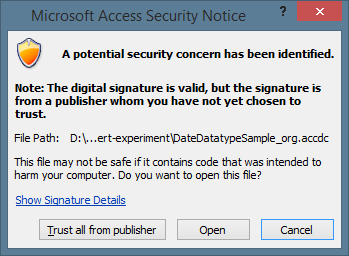 Associated certificate with the digital signature should be current one not the expired one. Signing person or organization that are known as publisher, must be a trusted one. Certificates that are associated with the digital signature are mainly issued by the reputed certificate authority (CA). Microsoft Office Access cannot save the digital signature at this time. *You may be in a database under Source Code Control. *You may be in a database which is read only. *The database uses either the *.accdb or *.accde file name extension. To sign such a database, click the Microsoft Office Button, point to the Publish menu, and then click Package and Sign. 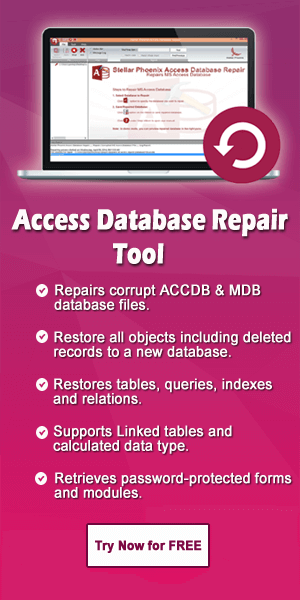 The .accdb or .accde database files are not signed through Visual Basic Editor, which was the case for Microsoft Access 2003 database files (.mdb). In MS Access 2007, when you create an .accdb file or .accde file, you can package the file, apply digital signature to the package. After then distributed the signed packed to other users. Package and sign tool keeps the database in an Access Deployment (.accdc) file, signs the file, and then place the signed package at your determined location. Users has the advantage to extract the database from the package and do direct work in the database. For Adding the digital signature, firstly you need to either get it or create a security certificate. Because if don’t have such security certificate then also need not to worry. As you can create the security certificate using the SelfCert tool (included with Microsoft Office). On your screen starting window, tap to the Start button, then point to the All Programs>Microsoft Office> Microsoft Office Tools> Digital Certificate for VBA Projects. Or else you can browse to the folder which contains the Microsoft Office program files. Here you need to locate the executable file, SelfCert.exe. Well the location can be different as per the OS right now you are using or as per the subscription version of office 365. Users of Office 2013, make search for the Office15 folder from the above options. Likewise, users of Office 2010: search for the Office14 folder. And users of Office 2007, search for the Office12 folder. Browse for the right folder and after getting such make double tap to the SelfCert.exe. This will open the Create Digital Certificate dialog box. In the opened box of Your certificate’s name, assign name for the new test certificate. Note: but if in case you are unable to see the Digital Certificate for VBA Projects command, or if you are not getting the SelfCert.exe, you may need to install SelfCert. How To Create A Signed Package? First of all open the database which need to package and sign. After then tap to the File> Save As > Package and Sign. Note: Access 2007 user, click the Microsoft Office Button > Publish > Package and Sign. This will open the Select Certificate dialog box on your screen. Choose the digital certificate and then hit to the OK option. You will see the Create Microsoft Access Signed Package dialog box pop-up on your screen. In the list of Save in list, chose any location for your signed database package. Assign name for that signed package in the File namebox, after then tap to the Create option. Access will make the .accdc file and keep it in the location that you select. On your access database hit the File> Open > Browse. The Open dialog box appears. Note: if you are an Access 2007 user then click the Microsoft Office Button > Open. Select the Microsoft Access Signed Packages (*.accdc)as file type. Browse for the folder that contain your.accdc file. After selecting it tap to the Open option. If you have selected the trust the security certificate which was used to sign the deployment package, the Extract Database Todialog box appears. Then go to the next step. But if you have not chosen the trust the security certificate, then the following message appears. 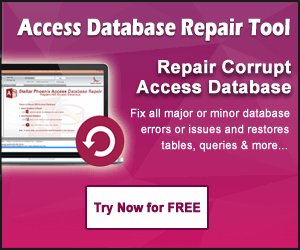 If you have trust on the database, click Open. If you trust any certificate from that provider, tap to the Trust all from publisher. This will open the Extract Database To dialog box appears. How To Fix MS Access “Search Key Was Not Found In Any Record” Issue? If you use a self signed certificate to sign a database package then tap to the Trust all from publisher after opening that package. As the packages signed through your self-signed certificates is always considered as trusted one. Tip: If you extract the database to a trusted location, its contents will be automatically enabled whenever you open it. If you choose a non-trusted location, some database content may be disabled by default.